Our contributor, whose grandfather was a World War I soldier, thinks the stamp is linked to the “Bonus Army” veterans. A bill was passed in 1924 promising WWI veterans a payment 21 years later -- dubbed a “bonus” -- in 1945. When the Great Depression hit, veterans organized to demand early payment of the bonus. They organized a protest march on Washington in 1932, demanding pay for their combat, and approximately 20,000 veterans camped out in the Capitol following the march. Weeks went by until Herbert Hoover ordered General Douglas McArthur to force the vets out. Two veterans were shot and killed, thousands were tear gassed. What role did this political stamp play in the veterans’ movement? 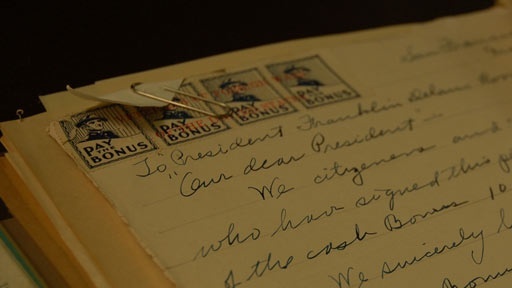 History Detectives reveals the stamp’s connection to the veterans' struggle.